Late again. It just won’t do! We promise to try harder next month. 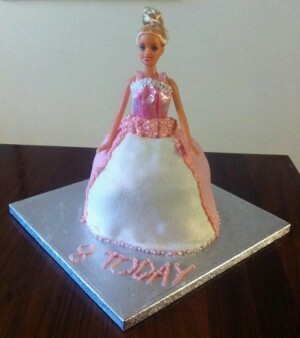 Our lateness takes nothing away from December’s cake of the month though – a Barbie-tastic creation that made one eight year-old with a Christmas Eve birthday very happy indeed. I used a giant cupcake mould and the following sponge recipe. The cake was assembled by turning the bottom half of the mould upside down and sandwiching the two pieces togetherwith the buttercream and some lemon curd (this is additional to the lemon curd in the ingredients above). Some trimming was needed to give a good rounded shape. There is a basic buttercream recipe here (I just replaced the milk with lemon curd). You’ll need to cut a small circle out of the centre of the top layer of the cake and then cut some of ‘Barbie’s’ legs off so her waist lines up comfortably with the top of the cake. I wrapped the bottom half of the doll tightly in cling film and put the top half in a food bag which keeps her clean but can be easily removed when you’re ready. I watched this tutorial for decoration and copied it as cloesly as possible but left of the ruffles. Instead , I just added a little pink food colouring to the leftover buttercream and piped ruffles over any joins around the waist. I also added some pearls around the bottom and waist. I volunteered for FCFK Hackney after being told about it by Katie Forsythe (a fellow FCFK baker and friend from work). I immediately thought it would be a brilliant thing to be involved with and thought the way it was organised was fantastic. I hadn’t long moved to Bow when I signed up and was looking for some sort of local volunteering – it just seemed perfect. I spend all day working on books (I’m an editor at a publishing house) all about children’s earliest years and so it is fantastic to think we are making a small difference to lots of childhoods.